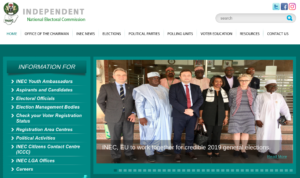 The independent electoral commission is a body set up in 1998 to handle all matters that concerns election in the country. Their main objective is to strives their best to conduct elections that will be acceptable to all Nigerians. In this article we shall give you the application guidelines to follow so that your application will be approved instantly. All is been set for the 2019 general elections in the country, INEC on her part has vow to conduct a credible election a cross all states and federation of the country. Note: Adhoc personal will be well trained on how to make use of the smart card reader that is going to be use in the 2019 general elections. So all those who are applying for the job as INEC adhoc staff need to get ready for the intensive training on how to make use of the card readers. You must be a a graduate or an undergraduate student from any federal institution. Those who want to apply as undergraduate should keep their ear on ground, inec said they will partner with the management of your institution which means an announcement will be made in your school. Those serving Corp members who are applying should follow the directives from their local government headquarters in their respective PPA.